Flame Body Contact with the Pok�mon may burn the foe. Enemy Pokemon have a 30% chance of becoming Burned every time they touch this Pokemon. Swarm* Powers up Bug-type moves in a pinch. "When this Pokemon's HP is 1/3 its max or lower, its Bug moves do 50% more damage." 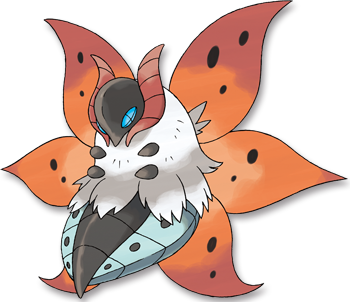 Black When volcanic ash darkened the atmosphere, it is said that Volcarona's fire provided a replacement for the sun. White A sea of fire engulfs the surroundings of their battles, since they use their six wings to scatter their ember scales.